this excellent dual purpose tent can be used horizontally for propagation tent or vertically and can be used as a small grow tent in it's own right. 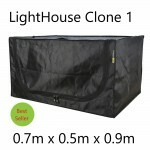 Constructed from Tri Layer 210 Denier material with special LightHouse UltraLux reflective liner and quality Tivax double lined zips that are easy to use and offer good light proofing with no snagging. The main frame is made from 16mm steel poles with nylon corners.